Mike Gibson is arguably the finest Irish player of all time. Accomplished in the 10 or 12 jerseys, Gibson's ability to mesh a backline together was years ahead of its time. 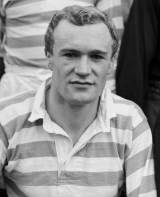 He made his Irish debut in 1964, and amassed 69 international caps, a mark that held until lock Malcolm O'Kelly surpassed it 26 years after Gibson's retirement. Gibson was born and educated in Belfast, and represented Campbell College before moving to study at Cambridge University, where he donned the famous blue. Gibson's versatility led to questions over his best position, but in truth his sublime handling skills, pinpoint kicking game and tactical brilliance made him a prime candidate for greatness in the centre and at outside half. Gibson made five British Lions tours between 1966 and 1977, a number only equalled by fellow Irish great Willie John McBride. During the 1968 tour of South Africa, Gibson became the first ever replacement in rugby history when he replaced the injured Barry John during the Pretoria test match. On the 1971 Lions tour of New Zealand, Gibson lined up alongside Barry John and John Dawes in one of the most potent midfields ever assembled. With the imagination of John complemented perfectly by Gibson's propensity to open up space with his spectacular line-breaking ability, the Lions took home their first and only tour win on New Zealand soil. Gibson's final game in the green jersey came in the second test of Ireland's tour of Australia in 1979. Ireland won the game and the series, and the 36 year old Gibson hung up his boots. His achievements are all the more remarkable due to the amount of time that he was able to perform at the highest level. His international career spanned 16 years, and took in competition at every level of the sport. His midfield partnerships on Lions tours would not look out of place in an all time XV, and it was often his ability to gel the different styles of play into a coherent backs division that brought them such great success. Following his retirement from the game, Gibson set up shop as a solicitor in his hometown of Belfast. He has been awarded an MBE for his services to the game and was one of the first 15 inductees into the inaugural International Rugby Hall of Fame. In 2011, he was also made a member of the International Rugby Board Hall of Fame. Gibson's career is something that Irish rugby can rightly savour, his rakish play paving the way for modern day greats such as Brian O'Driscoll and David Humphreys. While not a bulky, crash ball operator as with many new centres, Gibson was a modern player in all senses of the word. His understanding of angles and his uncanny ability to release the ball into space could unpick even the toughest of defences, and he surely would have enjoyed the challenged of modern day rush defence.